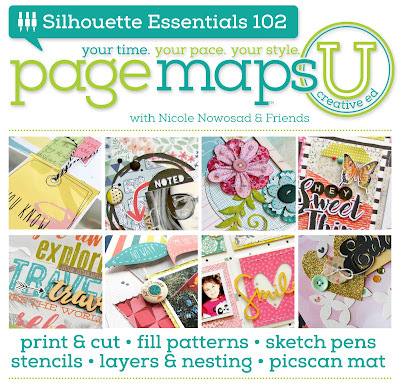 PageMaps: Win a spot in PMU's Silhouette 2 online class! Win a spot in PMU's Silhouette 2 online class! It's finally here! Nicole Nowosad's second installment of Silhouette Essentials! For your chance to win a free spot in this fantastic online class, just leave a comment on this post and share with us what your favorite spring flower is. We will draw a random winner on Saturday, May 14th. For all class details and a sneak preview, CLICK HERE. I would love to win a spot in this class and I love pansies! I'd love to have a spot in the class. My favourite spring flowers are tulips! Awesome giveaway! I love tulips! My favourite springish flower would be Anemones. They are white and fill my back garden! I would love to win this! My favorite spring flowers are lilacs and morning glories. Lilacs are definitely my favorite, and I miss them so much now that I live in Florida. Tulips are my absolute favorite flower. Thank you for the chance to win! I love lilies. I just got a Silhouette and would love to learn how to use it beyond the basics. Thanks for a chance to win. This sounds like a great class! I love the smell of honeysuckle in the spring. It doesn't last long but the smell is simply amazing. my favorite spring is lilacs.. love the smell and so pretty. thanks for chance at giveaway. Bluebonnets are my favorite - they blanket the roads in Texas! Thanks for the chance to win! I'd love to enhance my Cameo skills. My favourite spring flower is Hibiscus. Such a beautiful scent. My favorite spring flower is the daisy. So simple and sweet. Congratulations, and thank you! tulips- any color, but especially pink! Last year we finally had luck with forget-me-nots. I have a pot brimming with the little beauties so now they're my current favorite. My favorite flower is usually a daisy. I love the different colors they come in and how happy they make me! Virginia BlueBells are my favorite spring flower. I would say lilacs are my favorite spring flower. That would have to be bluebonnets. Pretty in a clump and just stunning when you get a whole field of them. I loce daffodils! They just make me smile!